Whether you are dreaming of a destination wedding on a tropical island, flower-filled nuptials at a local park, or a more traditional wedding service, there are a number of steps that must be taken to prepare for your big day. However, keeping track of all these details can be incredibly daunting. If you're looking for a tool that can relieve some of this pressure so you can focus on more important things, there are a number of wedding website services that can help take some of the stress out of planning your wedding. Many wedding website services can help you set up a personalized wedding website to manage invitations, reservations, gift registries, thank you notes, and so on. Additionally, a personalized wedding website can help you keep friends and family members who live in a different cities, states, or even countries informed of your latest wedding plans. Many wedding websites enable individuals to upload and download files, which is a wonderful service for wedding party members and guests who are trying to coordinate plans for your big day. The Knot is a wonderful online resource for those planning their big day. Not only do they have wedding gown pictures, flowers, hairstyles, invitations and favors but they’ve also created a free wedding website option to allow couples to streamline their RSVP process, assist out of town guests, share registration details, and more. The Knot’s wedding website building process is both flexible and simple for anyone to create. Do you need a wedding website, but aren't sure what features you want or how long you want to keep your website activated? If so, eWedding allows users to upgrade services at any time, and they offer a number of flexible payment options. However, this website does not quite offer the variety of features as our top-rated selection. Would sending "Save-the-Date" e-cards to all of your wedding guests at the simple click of a mouse be helpful to you? WedShare allows you to do this and more. Although WedShare packs a lot into their package, this also makes the website a little confusing. Another drawback is that you must commit to a one-year service agreement. With crisp and clean layouts and high resolution photo printing available, Wedding Window offers basic features to create a personalized wedding website with pizzazz. However, we found this website difficult and frustrating to use. Additionally, Wedding Window is more expensive than other providers, and many features are only available at an additional cost. While many wedding website services offer a number of useful features, some services are easier to use than others. Additionally, some services offer flexible payment options and others require long-term commitments. Therefore, you will want to carefully consider whether the wedding website service meets your particular needs. Features. Does the wedding website service give you access to the features that you are looking for? Navigation. Is the wedding website easy to use? Can you quickly create a useful, personalized wedding website for your special day? Price. Is the wedding website's price competitive? 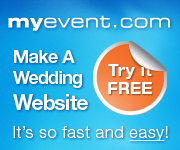 Does the wedding website service offer flexible pricing options that meets your needs? TopConsumerReviews.com has reviewed and ranked the best wedding websites available today. We hope these reviews help you plan for your special day! or simply those who are looking for something "spiritual but not religious" . To learn more about how you can create a unique, personalized wedding ceremony, visit her website. if shoppers are willing to go to websites such as Net-a-Porter, Mytheresa and Matches and spend $4,000 and $5,000 on designer dresses, surely they will be willing to do the same for their wedding.